Hi, I’m Auden Johnson, author of eleven dark fantasy stories and I’m your host for this stop in the Hunt. 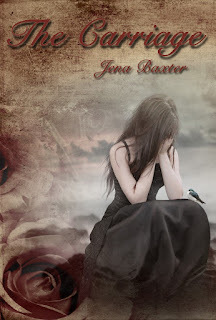 The author I’m pleased to be hosting for Virtual FantasyCon’s Blog Hop Hunt today is fantasy author, Jena Baxter. My name is Juliette Barrows, from Jena Baxter’s Reflections novel, and after much debate it has been decided that I will be the spokesperson for our part in Virtual FantasyCon this year. Since she is busy and all, you know. I’ll start by telling you about her. Jena Baxter lives in a small historic town in Northern California, not far from Clover Springs, where I live in my make-believe world. 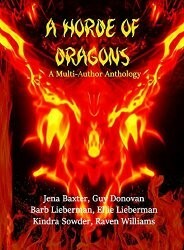 She has published three novels and has a short story in the anthology, A Horde of Dragons. Juliette pushes the hair from her face and sits up straight. Terribly ornery creatures. I have no idea what she sees in them, but Jena loves dragons, as well as angels, vampires, shifters, unicorns, and centaurs. She also created a creature of her own called a Prodirari, he is sort of like a vampire that doesn’t require blood to survive. Much cleaner if you ask me. His name is Ezra, and you can find him here: http://www.jenabaxter.com/2015/09/a-teenage-girl-enters-carriage-in.html in The Carriage, hanging out with my rival, Alexis Powell. Now for a little bit about my co-staring characters, and the other projects Jena is working on. I’ll start with my own story, since it’s the best. Just don’t tell my co-stars I told you that, they get so upset. Truth hurts. Hahaha. Reflections is about me getting trapped in a world a witch created. You just can’t trust servants these days, or those days I should say, since I spent my childhood in the Regency era. I know, cool huh? Anyway, the witch has a fetish for collecting exotic creatures, so I’m not alone, but I would gladly give up their company if it meant they could return to their families. 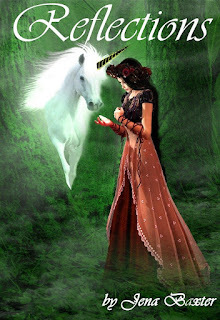 We spend our time trying to find a way home, and working on surviving in this strange world Jena, and Zylphia, created. Sometimes we watch Colovere’s 11 unicorns play in the meadow. Here is a link if you want to know more about my story: http://www.jenabaxter.com/2015/09/when-juliette-has-domestic-servant.html. The Carriage. I mentioned this one earlier. Two girls board a carriage in Central Park, but one of the girls, Brooke, curses her sister, Alexis. And people always say I’m bad; I had a servant beaten, but never cursed anybody in my life. So my rival, Alexis crashes into the Victorian Era. It’s pretty scary really, since she’s entirely a modern girl. She gets tossed about and rebuffs the gentleman that tries to help her. Pretty stupid if you ask me. I wish a handsome man would come break me out of my prison. At any rate, Ezra, the gentleman trying to help her is dead, having been murdered by an assassin his brother hired. His father knew a friend that knew how to save him, so he isn’t even human anymore. Here is the link to Jena’s website if you want to know more about the story: http://www.jenabaxter.com/2015/09/a-teenage-girl-enters-carriage-in.html. If you scroll down you will find a short story called Amos, written by Jena when fans wanted to know more about the brother who had their hero killed. Amos is free to download so, you can’t beat the price. Pretentious is Jena’s only story that has no correlation to fantasy. It’s about a boy who promised his father he would take care of the family, and the restaurant they run. But when he becomes a teenager, he realizes there is no time for a girlfriend, and he won’t have the ability to pursue his own dream of being a rock star. Aryn has dreams of her own, but she isn’t about to let Danny give up those dreams, so she applies for a job at Alfredo’s, and Danny’s world spins toward a future he thought he could never have. The question is whether or not that future is worth the cost. There are some stories on the back-burner, One is a book of fairytales with Author Raven Williams, but I’ll be posting more about those at a later date. In the meantime, you can follow Jena at any or all of these places. Did you find the number? If you did, then click Jena Baxter's link – http://jenabaxterbooks.blogspot.com/2016/10/virtual-fantasycon-blog-hop-hunt-hi-im.html to continue Virtual FantasyCon’s Blog Hop Hunt.